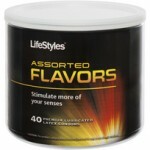 Lifestyles Latex Condoms Assorted Flavors 40 Pieces Bowl Display. Simulate more than your senses. Crank up the fun with intense colors and flavor scents. Lubricated with vanilla, strawberry and banana. Colors match the tantalizing flavors.